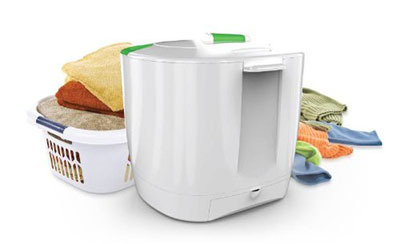 The Laundry Pod washes a small amount of your clothes manually. You use a bucket to fill it with water, crank the handle around, drain the soapy water (while you crank), fill it with more water from a bucket, then crank it again to rinse and drain your clothing. Which means it’s a plastic bucket that costs $89, and reviewers say it falls apart. Besides, if you were going to perform manual labor to wash your clothes, wouldn’t you just do it in the sink? For free?